To all the wonderful families who have adopted a horse, pony or donkey from HCW in the past 13 years please email me your pix and blurbs for the updates page and memorial page. Thanks! RIP Queenie 1986-2011. It's a very sad day here today at HCW. Queenie was a very very special horse and she will be missed by all of us here at HCW, 2 legged and 4!! Enjoy the green pastures up there old girl!! 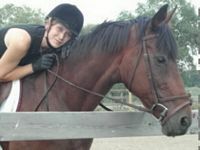 "Mojo passed away on November 20, 2010, very suddenly from colic. We still can hardly believe she is gone. She was a wonderful, funny, smart pony. Everyone loved her, even non horse people! The two years she was with us, were great. She was so charming, and every morning would bug me until I gave her a little ginger cookie that I would carry in my pocket for her. There was nothing so bad that a Mojo hug couldn't help. We miss her so much. Margo Harris"
"Hi Claire, It is with the saddest heart that I have to announce that on February 14th 2010, Campbell, the greatest horse that ever lived has passed away. He went quietly at around 10:30am yesterday morning. We adopted Campbell from you back in December of 2003, the day before my birthday. Campbell brought so much joy to myself and my entire family. We are devasted at the loss of Campbell and are sure that not even time will mend our broken hearts. Campbell lives on in our hearts and in our memories. Thank you for the best horse in the world." Update By Nancy Beauregard (nee Ellis). "June 8th 1978-April 1st 2008. Bella was a Welsh/Arabian cross mare. She had suffered a great deal in her life, but was one of the sweetest mares we have ever known. Bella was an inspiration to us all and she is sadly missed. 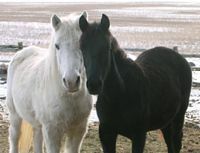 Bella met her twin, Misty at our farm who was a 13h welsh pony cross mare of the same age. During their time with us, the girls taught us all about how to deal with abused animals. Together they raised our young stallion when his mother could no longer take care of him. They gave us so much and we are so grateful they touched our lives. The girls were best friends and as was fitting, they went together. We are grateful to Claire and HCW for allowing Bella to be part of our herd. Run free girls, you deserve it." Update provided by Kara Burrows. 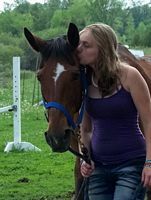 "Star was aptly named - she positively thrived once adopted through HCW at her new home in Erin, where she lived for 2 years. Her 1st battle was to beat extreme starvation, which was a slow but successful process.Unfortunately she was diagnosed with liver cancer at the U of Guelph hospital in October 2006. She was expected to live only a few weeks. But fighter that she was, she lasted to the 1st day of Spring. She was kind,and gentle and will be missed by her stablemates, especially her pal, Snickers, and of course her adopted mom, Carol. She is buried at home in a special place in my pet cemetery, with a beautiful stone horse's head guarding her grave.Many tears were shed and I hope to see her again one day." She died the 23rd of March 2007 at 1130 am, at age 23. Update by Carol Richards. Adopted Oct 2005. "The Heroux family and all of our friends at Dreamcatcher Equestrian Center in New Liskeard are sad today... we lost one of our best friends. 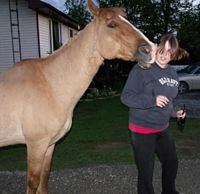 Lexus Red Rose came to us as a very sad little mare that had a heart of gold. Even though she was blind in one eye and had one knee that was larger than the other, she took it all in stride and did outstanding in all that she was asked. She went to local horse shows with beginner riders, mounted games (which she loved! ), was a camp horse, a lesson horse and a best friend to many. Her gentle nature, her glistening coat the colour of a new penny, and trusting soul made her very special... we will miss her terribly but know that she is in a better place and can watch us from above." Update by Sandi Heroux. Adopted. "Breeze passed away on February 6, 2007 after 25 incredible years. She touched everyone who knew her, she was a barn favourite and I can only call myself blessed for having her in my life for the few years I did. I know she's up there somewhere enjoying herself in a big ol' paddock." Update by Stephanie Shaughnessy. Adopted May 2004. 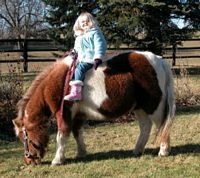 "For nearly 4 years, my family had the pleasure of taking care of a wonderful pony named Belle. 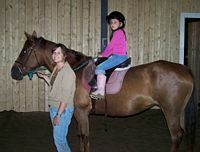 Although she was small in size, she had a big heart and taught many young children how to groom and ride. She loved all of her pasture mates and was an excellent babysitter when one of my horses was injured and needed a buddy. 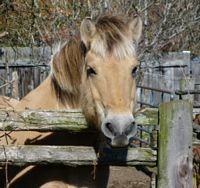 On February 7, 2007 we had to say goodbye to our dear pony who has left a huge void in our field. We miss her but know that she is at peace in greener pastures. One of my students (and one of Belle's) wrote this poem to my daughter for Belle:"
It seem that you were everyone's first pony. With those beautiful blue and brown eyes. Thank you, Belle, for all of the memories. Update by Robyn & Emily Freer. Adopted March 2003. "RIP - Feb 15, 2006". "RIP - Dec 7, 2005". "RIP - Sept 30, 2005". "RIP - Nov 4, 2004". "RIP - Nov 2, 2004". VICKI: Remembering you is easy, We do it everyday. You left the sweetest memories, This world can ever hold. To us you were very special, You had a heart of gold. Rest easy now Ms. Vicki, In the pasture you loved to roam. Your friends are always close to you, At this place you called home. Love always, Sandra, Joanne, Jessica "RIP - Oct 29, 2004". "RIP - Oct 4, 2004". "RIP - May 24, 2004".